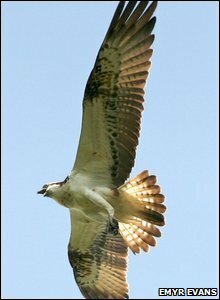 A male osprey has set up home on a 50ft (15.2m) tall man-made nest in Powys, raising hopes that Wales could soon have its second breeding pair. The bird of prey arrived at the Cors Dyfi reserve, run by Montgomeryshire Wildlife Trust, on Good Friday. Built on top of a telegraph pole, the nest has been dotted with white paint to resemble bird droppings, which makes it more authentic as a settled habitat. Wildlife experts hope a mate will arrive soon. Two ospreys, the only known nesting pair in Wales, returned to Gwynedd and produced their first egg of the season two weeks ago. It is the fifth year running that the ospreys have flown in from Africa to raise chicks in the Glaslyn Valley near Porthmadog. Hundreds of visitors watched the Powys bird from a brand new hide built as part of the Dyfi Osprey Project. They saw the osprey fishing in the River Dyfi and bringing his prey back to the nest. The manager of the Dyfi Osprey Project, Emyr Evans, said he had a wealth of experience to offer, having run the Glaslyn osprey project near Porthmadog for the past four years. "This is hugely significant for Wales," he added. "At the moment, Wales has one breeding pair of osprey, but hopefully a female will arrive and they'll be the second pair. "Last year, two ospreys showed interest in the nest but no eggs were laid. "I'm almost certain the the male bird on the nest now was here last year." 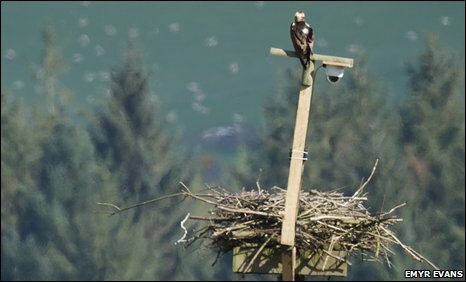 MWT built the nest out of sticks, wire and a 50ft telegraph pole in 2007, in an attempt to attract a pair of breeding ospreys to the site near Machynlleth. The nest was daubed with white paint in an attempt to imitate bird droppings, so the birds would think it was an established nesting site. Mr Evans said the osprey arrived in the area last Friday afternoon and spent the weekend carrying our maintenance work on the nest. The nearby hide will remain open throughout the summer and a new visitor centre will open at the reserve on 25 April. Visitors will also be able to view the osprey on two large plasma TV screens, and they can hear them too, because over the winter the trust placed two high-definition cameras and a microphone on the nest to allow a true birds' eye perspective. "Everybody at the trust has worked so hard over the winter setting up this brand new osprey project in Wales, so you can imagine our absolute delight when this male osprey decided to set up home right here on the Dyfi," Mr Evans said. "The osprey is Wales' rarest bird and we hope that by attracting a pair to the Dyfi to breed, we can increase their numbers. We all have our fingers crossed that our male will soon find himself a girlfriend."